Catherine looked lovingly at her husband throughout the event. Source: Getty. They might have a tough schedule on their hands as they constantly attend a series of royal engagements around the world, but the Duke and Duchess of Cambridge had time to let their hair down on their latest outing together – and they looked more loved-up than ever. Catherine, 37, put on a stunning display in a stylish emerald green outfit, choosing a fitted Alexander McQueen coat coupled with a matching hat and simple black heels. Adding some statement emerald jewel earrings, and tying her hair back in an elegant up do, the mother-of-three looked incredible as she shared a series of loving glances with William – who dressed up for the occasion in his Irish Guards Frock Coat. Catherine looked beautiful in emerald green. Source: Getty. The pair were watching a traditional parade of the Irish Guards as they visited the 1st Battalion at its base in Hounslow, London. William has been colonel of the regiment since 2011. 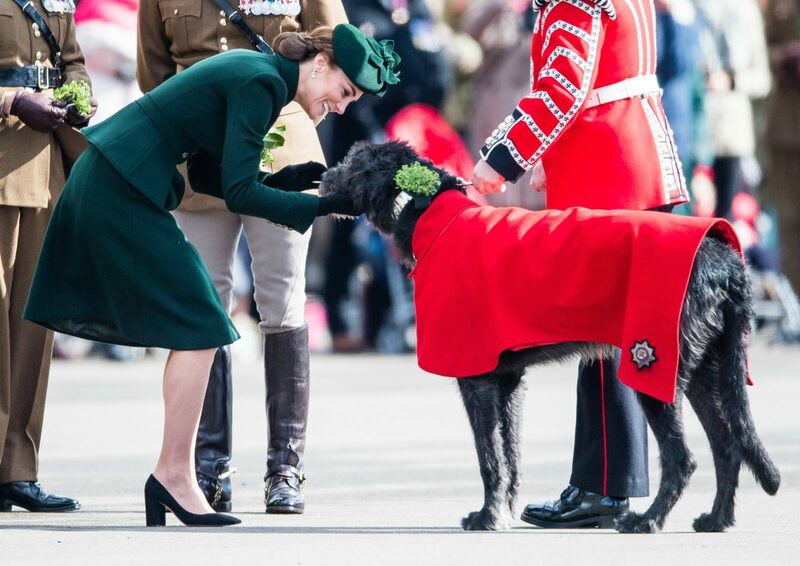 While the duchess presented sprigs of shamrock to officers and warrant officers, William saluted during the parade, before the pair had time to meet Domhnall, the Irish wolfhound joining the officers on the day. Showing her love of animals, Catherine bent down to pat the pooch and looked in her element as she flashed a huge smile. Catherine looked in her element as she petted the adorable dog. Source: Getty. 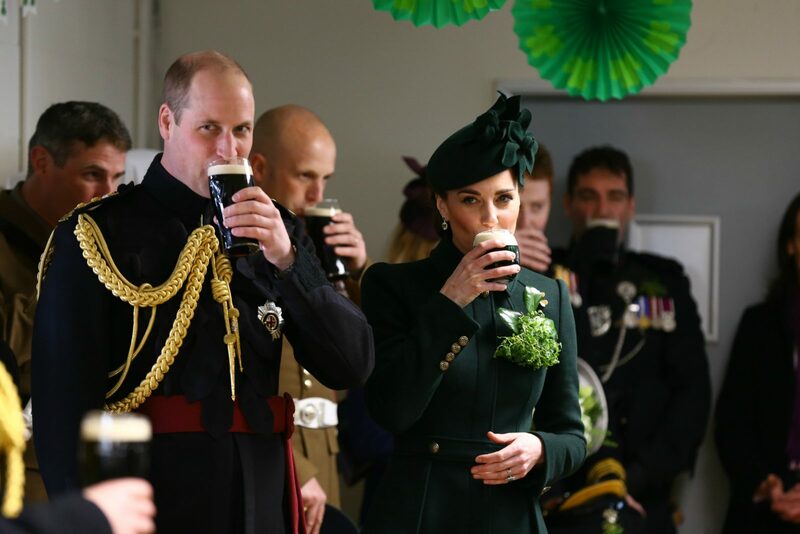 In true St Paddy’s Day style, the couple then indulged in a spot of Guinness each and were pictured taking their first sip in front of their hosts. This time last year, Catherine was still pregnant with Prince Louis so famously opted to drink water rather than Guinness during the event. However, there was a moment of sombre reflection and sorrow during the visit, as William and Catherine later led a minute’s silence to pay respects to the New Zealand terror attack victims following the horrific attack in Christchurch on Friday. The pair indulged in a sip of Guinness. Source: Getty. They were joined by around 350 soldiers who all marched on the Parade Square, surrounded by their closest family members. The outing came after they joined the rest of the royal family in paying a heartfelt tribute to the people of New Zealand this weekend, after the shocking mass shooting in Christchurch. On Friday afternoon the city in the country’s south island was targeted in what has been described as a designated terrorist attack – leaving 50 people killed. Do you like Catherine’s latest look for St Patrick’s Day?